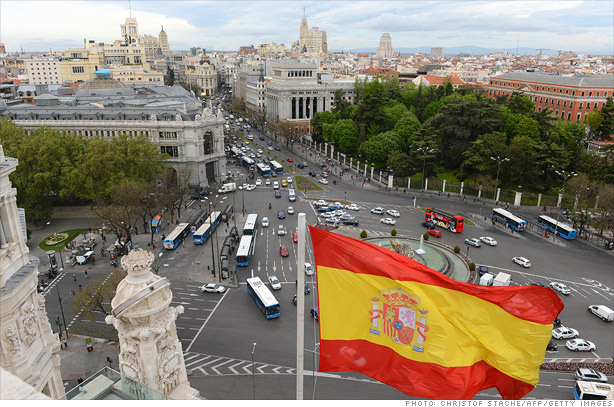 The spike in demand for Spanish and Italian debt comes after ECB president Mario Draghi unveiled details of a new bond-buying program, known as Outright Monetary Transactions, or OMTs. Spain is widely seen as the most likely candidate to apply for the program, but prime minister Mariano Rajoy has said he wants to know more about the conditions before making a formal request. Draghi stressed that "conditionality" is the main difference between the new program and past interventions in the secondary market for government bonds. To benefit from OMT, a government must ask one of the eurozone bailout funds, most likely the European Stability Mechanism, to buy its bonds in the primary market. This means any government that wants ECB support must commit to a "macro economic adjustment program," which could involve strict deficit-reduction targets, structural reforms and outside oversight. The leaders of Spain and Italy had already been wary of what conditions might be attached to the ECB's program even before it was announced, said Nicholas Spiro, director of London-based consultancy Spiro Sovereign Strategy. "In the eyes of Madrid and Rome, the costs of complying with the conditions attached to bond-buying are becoming more onerous while the benefits of requesting the aid are becoming less and less obvious - particularly as far as Italy is concerned," Spiro wrote in a note to clients. While the OMT program is certainly one of the boldest steps the ECB has taken to date, Sprio notes that there are several politically fraught decisions that must be made before any bond buying can occur. "Right now, the markets continue to rally mostly on Mr Draghi's verbal intervention," he said. "Yet in order for Madrid's hand to be forced, sentiment will almost certainly have to deteriorate dramatically."